I love how you have put so much effort into piping the 'stars' of filling onto each macaron half. I'm sure these tasted lovely, especially with the addition of the lemon curd! Wow yours came out so pretty!. I love how you piped your filling in. Mine were quite a mess! Just gorgeous Nic... and ever so inspired. I love the way you did the macarons! Thanks for bringing them over to MacTweets. I love them!! You should start your own cake shop Nic - they look amazing! These look so yummy, may have to give them a go for Pudding Club. MMMmmmmm, I can almost taste the tang of that lemon from here. They look fantastic. Lovely! I have to perfect my macarons as I am frequently dreaming up flavour ideas that I as yet lack the skills to make! In fact I have a lemon cake in the oven at the moment. Gorgeous. i admire your patience and creative talents in making these delightful bites. I've never attemtped anything like this yet. What a fun idea! I love lemon! Nic the mac is just gorgeous! Wow and I love anything lemon but boy I'd love one or two of these! I must try your recipe! Beautiful! I made y first ever lemon meringue pie this week, maybe this could be the next challenge. They look beautiful, Nic. How beautiful are these?! Love the famous LMP so I bet these are delicious little bites. so dainty and refreshing! this is some excellent work, nic--the macaron shall never become tiresome! lemon is a fabulous flavour for any kind of treat. So beautiful! What a perfect combination of flavours. I keep meaning to have a go at making macarons but fear I'm a bit clumsy for something so delicate! 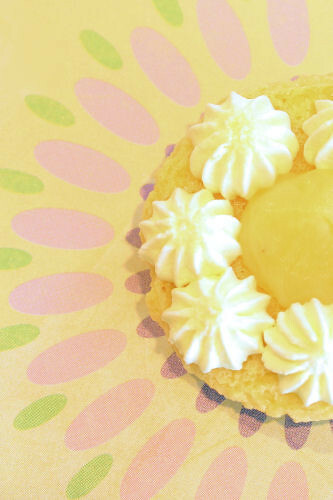 Saw your lemon meringue macs on the MacTweets roundup. Such sunny-looking macarons. The piped star filling is a cute touch! Such pretty macs, and I bet they were delicious! 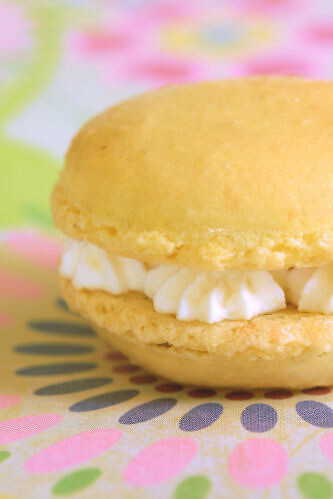 Lemon is actually my favorite flavor for macaron filling. I love the soft crunch and the smooth curd inside. I can only imagine how delicious they were with cream as well. Yummie & lovely food! Great pictures too! I just moved my blog to wordpress.com/ Come over @ my blog & check it out!! You must update your RSS too, my friend!